Coowon Browser for Windows XP - a popular utility that allows you to browse the web, download media files on a personal computer. It opens several accounts in offline windows, adjusts transparency, backgrounds, themes. The program is used to run online browser games in the background, has good multitasking. It changes the speed of viewing video and audio files, interacts with game joysticks. In the product, a new function of mouse gestures, giving the ability to quickly switch between tabs. 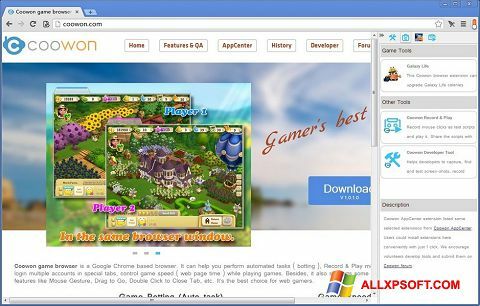 You can free download Coowon Browser official latest version for Windows XP in English.